It is no secret that I love quick and easy dinners. In fact most of the recipes on my site are quick and easy ones. Two of my favorite quick and easy, kid friendly meals are taco pasta and pizza pasta. 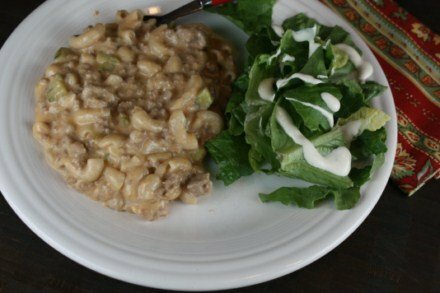 Both these meals are family favorites and are on the menu plan often. 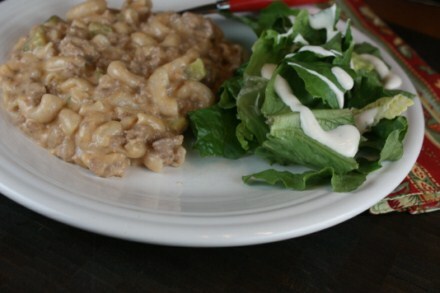 Today for ground beef Thursday I have yet another quick and easy, kid friendly meal for you. This Bacon Cheeseburger Pasta has become one of my kids’ favorite meals. It is creamy and delicious and oh so very good! And it is no wonder because how can you go wrong when you mix bacon, ground beef, and cheese all in one meal. In a large pan brown ground beef. Drain off any fat from the meat. When pasta is done stir in sour cream, bacon, pickles, cheese, and salt. I love your quick easy meals. They have been a hit in my house. I have a bunch of picky eaters! The flavors are great and I’m not very creative in the kitchen. I can’t wait to try this one!! Thank you, that is really nice. I love sharing my quick and easy meal ideas and I am glad that you enjoy them. This reminds me a bit of a meal that my kids always request. I made it up and call it Ranchy Rice, and it is super simple. I cook a pot of white rice, and while its cooking, I brown some ground meat (however much you have on hand, about 1/2 – 1 lb.) When its browned, drain fat as needed, sprinkle with an envelope of the Hidden Valley Ranch salad dressing powder, then combine with the rice and enough plain unflavored yogurt to bind the ingredients. We usually eat it about the consistency of the pasta in your photo. Thanks for your blog. I look forward to reading it each day! Made this a few times without the pickles. Its delicious! We use dill because that is what most in my family likes, but I think either would be fine. I would say use what you have.